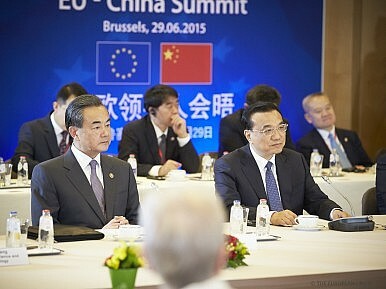 Chinese Foreign Minister Wang Yi (L) and Premier Li Keqiang at the 2015 China-EU Summit. The main deliverables focused on economics, as is typical for China-Europe summits. Li announced that China will play a role in Juncker’s investment plan, the European Fund for Strategic Investment, that calls for 315 billion euros ($353 billion) to be invested in strategic projects around Europe – including infrastructure projects, China’s main area of interest under the Silk Road Economic Belt framework. The two sides launched a “connectivity platform” which, according to Juncker, will “allow us to combine forces, uniting expertise and strength of our companies to develop high-quality infrastructure.” China and the EU will also explore an investment platform to facilitate cooperate on infrastructure and transportation projects. As Li pointed out, that meshes perfectly with China’s own Silk Road plans. But the careful messaging was overshadowed by current events, something Li himself bemoaned a bit during the wrap-up press conference. Li arrived in Belgium the week before the EU faces a major test – a referendum in Greece that could led to that country’s withdrawal from the euro currency bloc. Greeks will be asked to vote on the plan offered by Greece’s creditors, which would provide further economic aid while mandating more austerity. EU politicians have warned that if Greeks vote down the bailout (as Prime Minister Alexis Tsipras has urged, calling it “blackmail”) they are effectively voting to leave the eurozone – posing a threat to the coherency of the EU as a whole. Without an agreement, Greece is expected to default on a 1.5 billion euro ($1.6 billion) debt to the International Monetary Fund (IMF). Tusk referenced the situation at the end of his press conference, saying “it is simply not true” that Greece’s government can strengthen its negotiation position should Greece vote “no” on the referendum. With Greece and the eurozone on the edge of a catastrophe, the question of how China will respond looms large. As Mu Chunshan wrote for The Diplomat last year, China’s diplomacy with Europe (both the EU and individual European countries) is primarily driven by economics — meaning a “Grexit” is of particular concern to China-EU relations. The EU is China’s largest trading partner, with bilateral trade between the two sides worth over $600 billion in 2014. An economic crisis in the EU – including a threat to the eurozone – could be a disaster for China’s already-slowing economy, especially as Beijing will only become more interested in Europe as its Silk Road project develops. In a meeting with European Parliament President Martin Schulz, Li said that the debt crisis in Greece is of concern for China and the world, not just the EU. China “expects an adequate solution to the Greek debt issue,” Xinhua paraphrased Li as saying. However, China, with its massive stockpile of foreign reserves, is also in a position to help Greece out – should it choose to do so. On Monday, even as Li and his counterparts began meetings in Europe, Foreign Ministry spokesperson Hua Chunying said “China hopes to see that Greece will stay in the eurozone.” Still, Hua implied that China will not be active in helping find a solution: “[We] believe that the members of the eurozone are able and wise enough to solve the debt problem appropriately,” she said. Li said, without specifying, that “China has taken real actions to respond to the concerns and requests from the Greek government” and that “China is ready to play a constructive role” in resolving the crisis. It doesn’t sound like a formal loan is in the offing, but China could help in more indirect ways, particularly as Greece is a natural fit for China’s Silk Road plan. Last year, when Li stopped in Greece, China and Greece signed deals worth $5 billion, centering on a Chinese stake in the port of Piraeus. China’s interest in Greece is a counterpoint to falling levels of foreign investment from other countries, and could provide a much-needed lift for Greece’s economy. China’s Charm Offensive: Beijing Draws Closer to BrusselsChina's 'Belt and Road' Reaches EuropeChina's Big Week for European DiplomacyCan China-Turkey Relations Move On?China’s $1 Trillion Investment Plan: Stimulus or Not?